Looking for something very easy to read in Arabic? 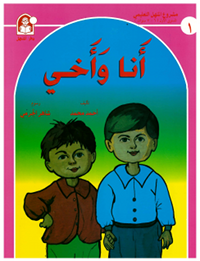 In this article I will introduce the very first book in Al-Manhal’s series of children’s books for learning Arabic, called أنا وَأَخِي ’anaa wa ’akh-ii ‘me and my brother’. This is a very simple text that you should be able to handle even if you have a very small vocabulary. It’s a perfect text to read after you have worked through the Bite-Size Arabic book. Although it’s very simple, it also introduces some important vocabulary about one’s daily routine, such as ‘wake up’, ‘bathe’, and ‘go to sleep’. The book can be ordered here from Jamalon, a Jordan-based online bookstore. It can be downloaded in PDF form here. Should this link become unavailable in the future, please leave a comment below and I will find a new link. (I don’t want to host the file directly on this site, because it’s copyrighted material.) Within certain PDF viewers (but not all PDF viewers!) you can listen to embedded audio by clicking on the text. There are two videos on YouTube with audio of someone reading the book. The first of these seems to be made using audio from the publisher. The voices are of young children. The Arabic is very correct. The second video has a single adult voice reading. You may find his voice less annoying than the sing-song style of the two boys in the first video. Note that the narrator’s pronunciation of the word صباح ṣabaaḥ ‘morning’ and صباحًا ṣabaaḥan ‘in the morning’ is very unnatural. The vowels should have the quality of the a in father through the entire word (i.e., IPA [sˤɑ.ˈbɑːħ]), as it is pronounced in the first video. To help you read the text I have prepared a vocabulary sheet, which you can download here. My suggestion would be to purchase the book or print out the PDF version, then try to read through it, using the vocabulary sheet for the new words. When you have read through the book all the way, go back and listen to the book using one of the videos above.